Body Wraps are the latest answer to losing weight. As body wraps cannot be self administered, there are salons in big cities which offer their services to put you in a Body Wrap.Body Wraps can actually be used to tighten your droopy skin and perk you up. Body wrapping is done to eliminate toxins, for treating eczema, for tightening the skin, and for removing inches from your body.Just a single session can take inches off your body. First of all, the salon assistant measures your body in different places. As many as eighteen different measurements from different parts of the body are taken. The jaw line, upper chest, neckline, below the bust, abdomen, waist, hips, bottoms, knee, thighs, calf, forearm, thigh and wrist are all measured in precision. Clay paste and mineral salt is applied all over your body and you are tightly wrapped from down the ankle to up the neck. Warm cotton bandages are used and these are previously soaked in a solution of mineral salt and clay.Old and dead skin is exfoliated and tissue waste is drawn out, thanks to the mix of clay and salt.The process of detoxification is what is responsible for the inches being lost and the skin being tightened and firmed up. By this method, you tend to loose inches in the form of bulging flesh, but there is no loss of weight. Soft body tissues are compacted and body contours are sculpted due to the body wrapping. 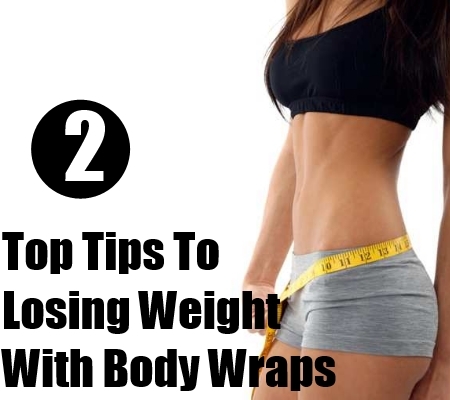 Body wraps for weight loss is actually body wraps for losing the inches and not the pounds. Your body is made supple and firm and all ugly bulging flesh is got rid of. You are asked to lie down on a bed and left there with a thermal blanket that you may sweat out all your toxins. You tend to fall asleep, but this for less than an hour. The blanket is removed after about an hour. The soggy bandages are quickly removed and mud is wiped off from your body. You are advised not to bathe for as long as possible. The residue of clay solution on your skin continues the dual process of tightening and detoxification for as long as it is on. Once the bandages are removed, you are measured again so that you can check for yourself how much flesh you have lost from your waist, calves, tummy and all else. Though this is not obvious at once, you are sure to feel revitalized and toned up with a healthy and soft looking skin.